Do you have a handful of favorite weeknight meals? I have a list of my standards – my “go-to” meals – the meals all 6 of us love. 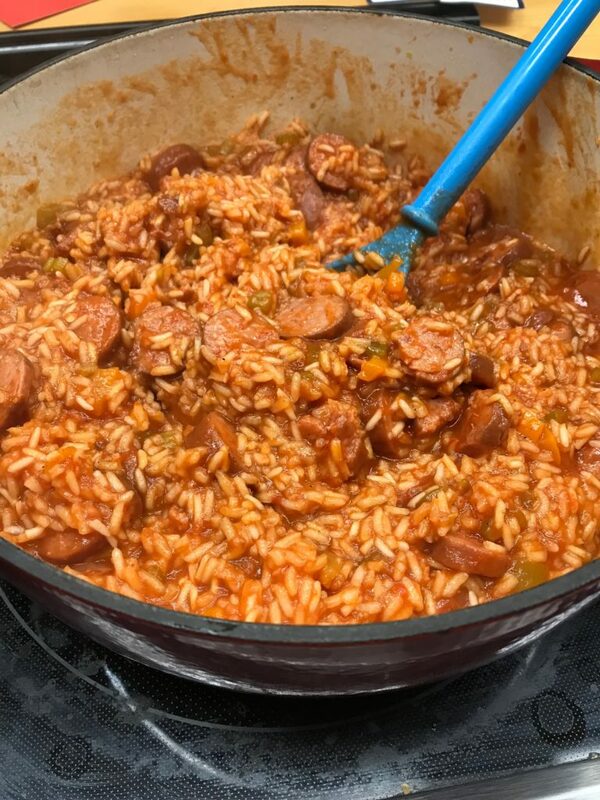 For my family, this easy jambalaya ranks right up there with homemade pizza and tacos. We all LOVE this meal. 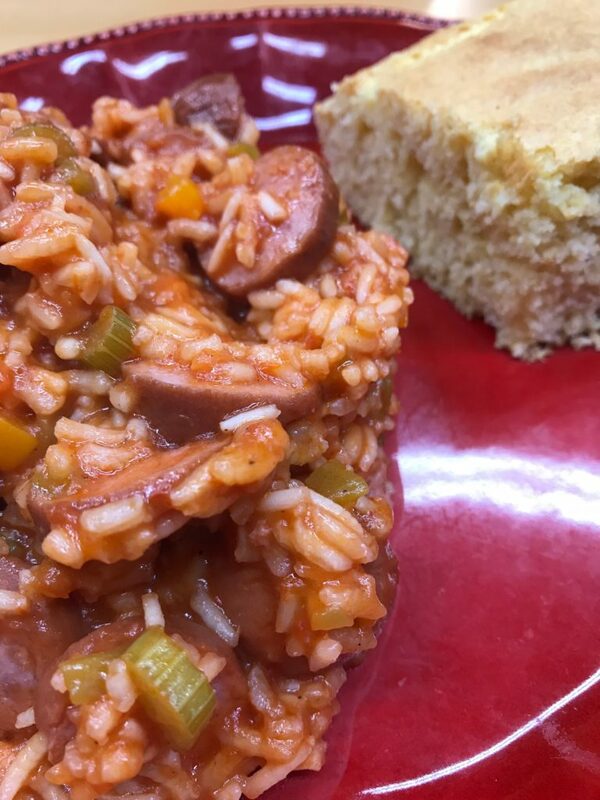 Jambalaya is a one-pot meal that consists of rice mixed with veggies and meat or seafood. First, I’m a huge fan of one-pot meals. Who doesn’t love having less dishes to clean up? Second, I’m pretty honest about who I am…and I’m not a foodie or a gourmet cook. I’m just a girl who likes good, easy, simple food. 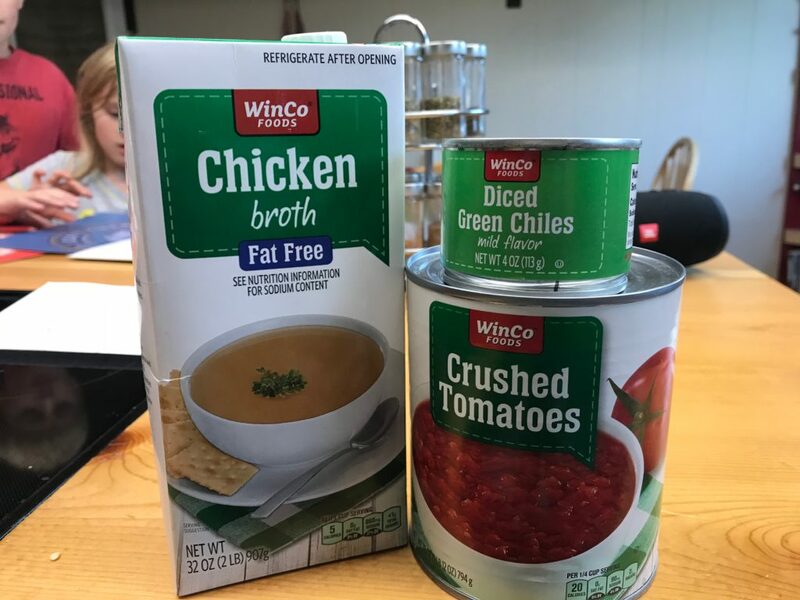 I’m a busy mom who likes to cook, but really loves finding recipes that are easy to make, and kid and budget friendly. This doesn’t have a lot of complicated steps or hard-to-find ingredients, and is easy to whip up. I’ve been meaning to post this one on the blog for YEARS now. It’s one of my favorites and I hope you like it! *My family doesn’t like onions, but if yours does, I’d go ahead and sauté 1/2 an onion with the garlic, celery, and pepper. *I’ve also made this using 1 pkg. of kielbasa and 2 diced chicken breasts. 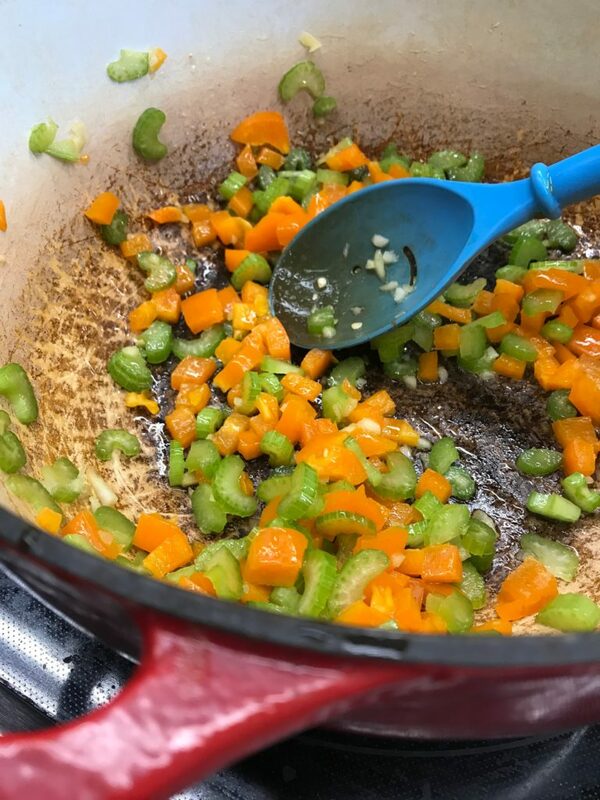 Start by sautéing your garlic, celery, and bell pepper in olive oil. 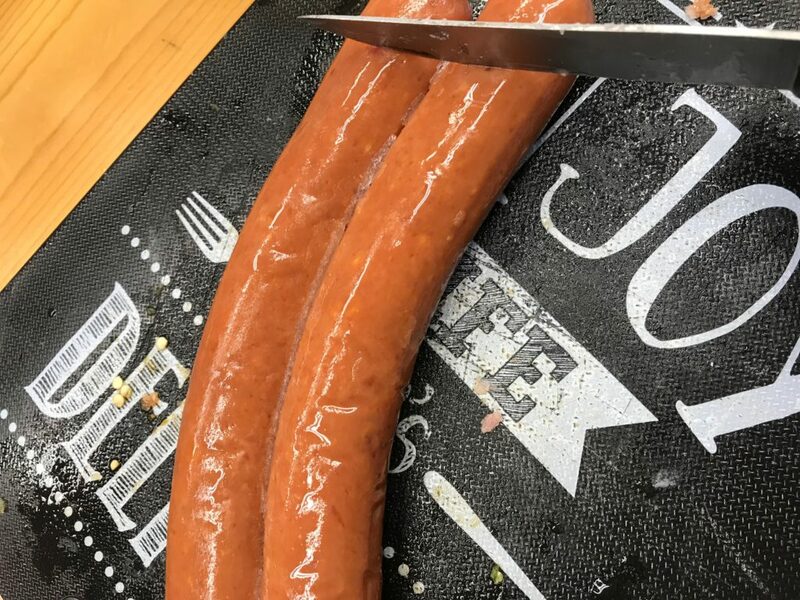 While your veggies are softening, slice your kielbasa. The picture shows 1 pkg. worth. I used 2 pkgs. or 4 links. I’ve made it with one pkg. of meat, and it’s turned out just as tasty. Add in the sliced kielbasa, and allow it to cook for a few minutes. 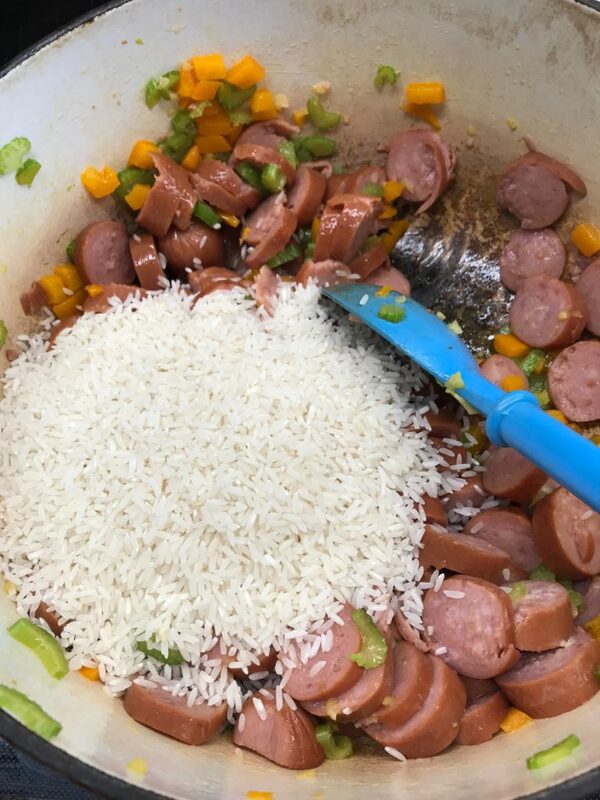 Next, add your rice. Stir, and cook together for a minute or two. Add in your stock, tomatoes, and green chiles. I always start by adding in just 3 cups of stock – but keep the other cup on hand. Sometimes I find that the rice just needs more liquid to get fluffy. But- start with 3 cups. 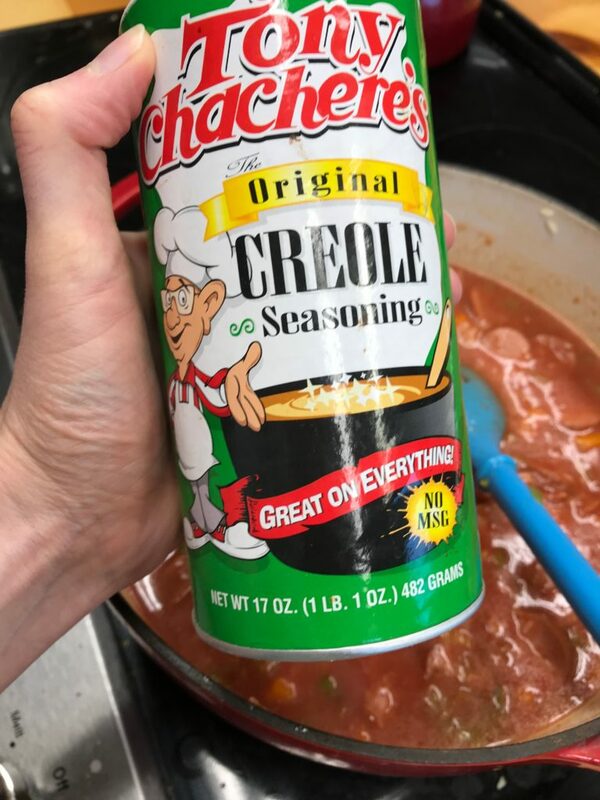 Add in your cajun seasoning. Have a gentle hand! I like to give a few shakes, and then taste the broth! It’s easy to add more, but much harder to make something less spicy. I’ve found that a little goes a long way with the seasoning! Bring to a boil, then cover, reduce heat to a simmer and cook until the rice is fluffy and the liquid has almost reduced. This recipe serves 2 adults and 4 kids with healthy appetites with some leftover. (It’s great reheated the next day for lunch!) I almost always serve this with corn bread. 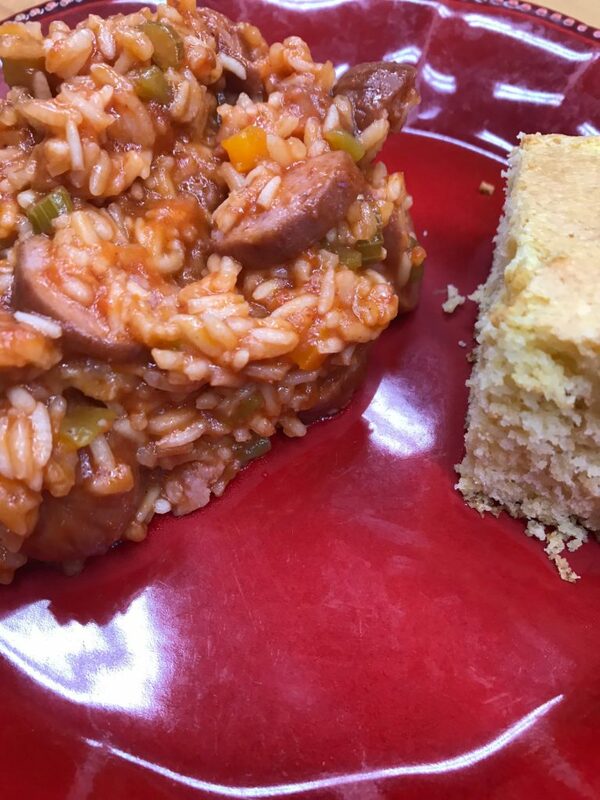 I am always looking for quick and easy meals to serve my family, and this looks so yummy too!